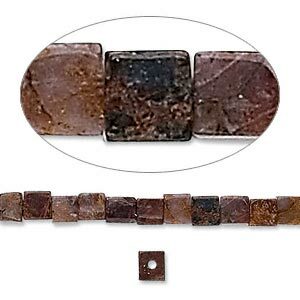 Bead, pietersite (natural), 4x4mm cube, B grade, Mohs hardness 6-1/2 to 7. Sold per 15" to 16" strand. The name was given to honor its discoverer, Sid Pieters, who found it originally in Namibia, Africa. Our material comes from a recent find in China. Pietersite is a rare variation of tigereye. This Chinese material commonly possesses an exciting blue chatoyancy. Pietersite is also called "eagle's eye." 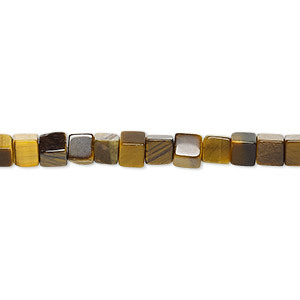 Bead, tigereye (natural), 4x4mm cube, B grade, Mohs hardness 7. Sold per 15-1/2" to 16" strand. 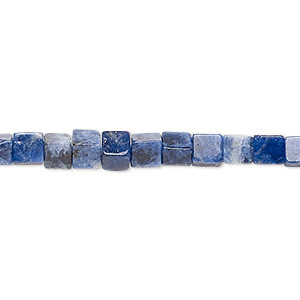 Bead, sodalite (natural), 4x4mm cube, B grade, Mohs hardness 5 to 6. Sold per 15-1/2" to 16" strand. 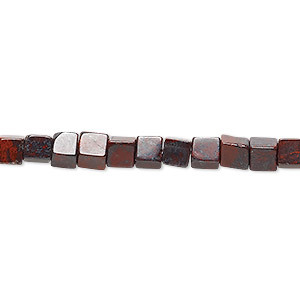 Bead, brecciated jasper (natural), 4x4mm cube, B grade, Mohs hardness 6-1/2 to 7. Sold per 15-1/2" to 16" strand. 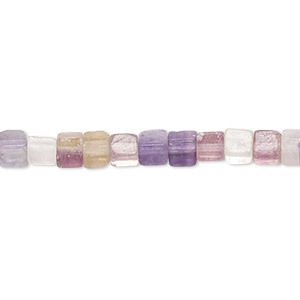 Bead, rainbow fluorite (natural), 4x4mm cube, B grade, Mohs hardness 4. Sold per 15-1/2" to 16" strand. 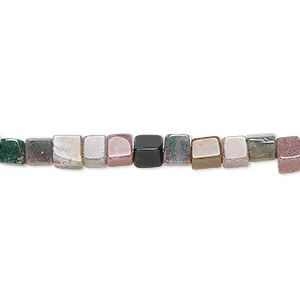 Bead, fancy jasper (natural), 4x4mm cube, B grade, Mohs hardness 6-1/2 to 7. Sold per 15-1/2" to 16" strand. 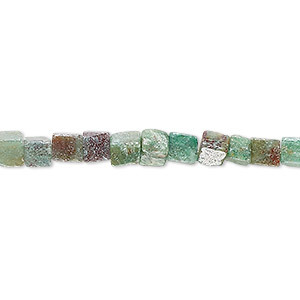 Bead, African "jade" (quartz) (natural), 4mm cube with 0.5-1.5mm hole, B grade, Mohs hardness 7. Sold per 15-1/2" to 16" strand. 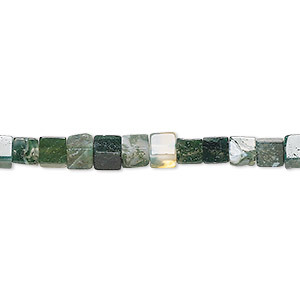 Bead, moss agate (natural), 4x4mm cube, B grade, Mohs hardness 6-1/2 to 7. Sold per 15-1/2" to 16" strand. 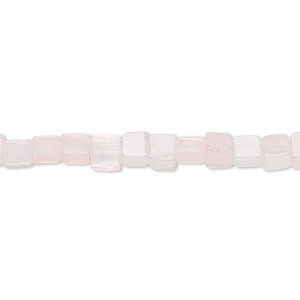 Bead, rose quartz (natural), 4x4mm cube, B grade, Mohs hardness 7. Sold per 15-1/2" to 16" strand. 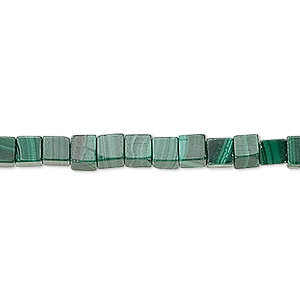 Bead, malachite (natural), 4mm cube, B grade, Mohs hardness 3-1/2 to 4. Sold per 16-inch strand. 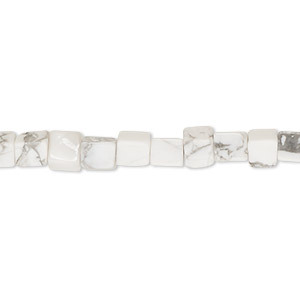 Bead, white howlite (natural), 4mm cube, B grade, Mohs hardness 3 to 3-1/2. Sold per 15-1/2" to 16" strand.